Having spent a lot of time traveling in South America (and most of that while bringing in little to no income), I have learned how to stretch a dollar (or five). Besides airfare, your number one expense while traveling is usually going to be where you lay your head at night. And if you are traveling as a couple, even your average hostel is going to start to add up (and let’s be honest, hostels are not always the preferred option). Enter Airbnb. A fantastic site that offers you a wide range of options from a couch in the corner to a mansion on the beach. In countries such as Colombia, Peru, and Ecuador, even on a night-by-night basis you can find rates for renting an entire apartment comparable to paying for a hostel. Not being the backpacking type, I prefer to set down roots temporarily in a city for the opportunity to live like a local for a time. This means I rarely spend less than a month in any city. What I was delighted to find, was that many apartments on Airbnb actually provide discounts for longer term stays. 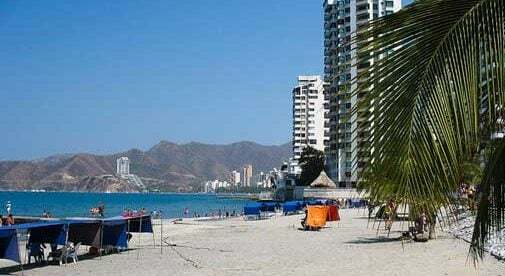 When booking my stay in the Caribbean town of Santa Marta, Colombia, I found discounts between 40% and 60% off the nightly rate when booking for more than two weeks. After about 20 minutes of searching and comparing, I settled on a beachside luxury studio for $603 for a month. Booking by the nightly rate would have cost $1,550 for the month, so I saved $947. The actual discount will vary from host to host, but, especially in the slightly less in-demand cities, you will usually find between a 50% to 60% discount for a month-long stay. Even in major cities, there are still good deals to be had. Staying in Buenos Aires, Argentina, I was able to rent a duplex in the coveted Soho Palermo neighborhood for $732 for an entire month (with a total discount of 26% off the nightly rate). Airbnb has become a business for many in South America, where people work full-time managing multiple Airbnb apartments. The upside of this is you are often dealing with someone very keen for that five-star review, and hosts will often go out of their way to make sure you have a memorable experience. “Housewarming” gifts have included wine, fresh cut flowers, even bicycles to use to explore the city. One host offered the use of his other property on a secluded private beach for no extra charge since it was vacant one weekend. Discounts are often offered for as little as a week-long stay. Make sure to always check varying dates and the rental details, because it can happen that a six-night stay may cost more than a seven-night stay when the discount kicks in for the seventh night (for example, a $30 per night rate would be $180 for six nights vs. $168 for seven nights with a 20% discount). Whatever your time needs are, whether it’s a week, a month, or longer, Airbnb is a great place to start to get upscale local living at a discounted rate.